The ST 2400 series is perfect for: Restaurants, hotels, schools, gymnasiums, gas stations and commercial companies. Vandal-proof steel housing: Theft-proof attachment. Flush wall mounting arrangement prevents access to the back of the device. All components designed to maximum duty, maintenance-free and long service life. 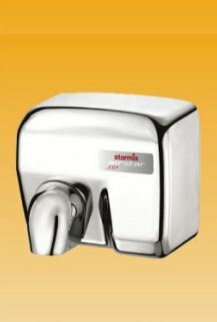 The optimized, revolving air jet concentrates the flow of air and ensures effective rapid hand drying – cost and energy saving.